Who is in charge of "Show and Tell" in your classroom?? Teachers everywhere are using great technology to encourage student production that fosters independent learning. These awesome educators are no longer running all the learning in their classroom, but instead, students are in charge of a great deal of the “Show and Tell” that takes place at school. This is a hallmark of true engagement and learning. Unfortunately, these heroes of the classroom often go unnoticed as they are too busy facilitating, planning and experimenting to share or broadcast their own efforts or the endeavors of their students. 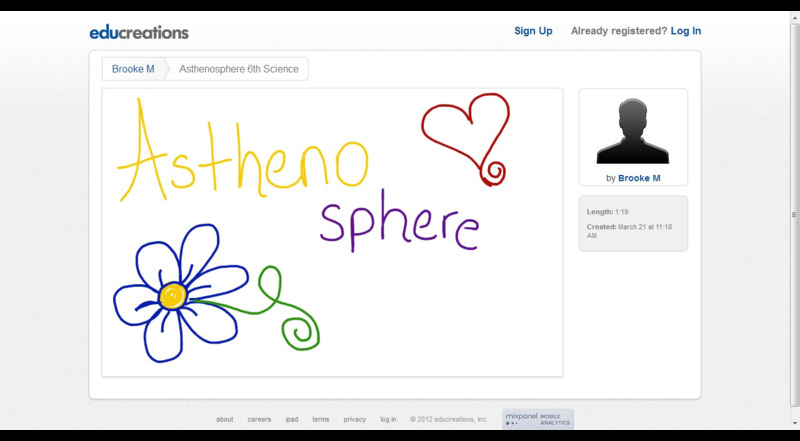 Enjoy this student product created on Educreations in Mrs. Taylor’s 6th Grade Science class. This was their first project using this app! What have your students created today…. Author adminPosted on April 5, 2013 Categories GeneralTags IFTTT, Middle School, TECH TREK, TechnologyLeave a comment on Who is in charge of "Show and Tell" in your classroom?? What did you do today at school? This is the question we hope that students are being asked by supportive parents as they eat dinner together each evening as a family! Right?? Well, this may not be the picture of the modern family, but it is still an important question that someone somewhere should be asking. What would the answer be and what would we hope it to be? Are students spending their time passively or actively learning? Students in Coach Sutton’s Social Studies classes were collaborating on Google spreadsheets as they researched countries and compared the governments, religions, and economies. Students in Mrs. Taylor’s Science classes were using iPads to research earthquake activity in our area. Mrs. Burns’ AP Writing class was videotaping the commercials they had written. So..what did YOU do at school today?? In an effort to move toward student production on the iPad, Educreations has been added to our devices. As always, it takes a great teacher to get out there and test the waters for everyone, and our 6th Grade Science teacher, Mrs. Taylor, played with Educreations to produce the following video on models. This Educreation was then embedded in her Edmodo for students to use in centers this week, and then next week, students will be publishing their own Educreation. Author adminPosted on March 18, 2013 Categories GeneralTags IFTTT, Middle School, TECH TREK, TechnologyLeave a comment on Get Creative with Educreations!! Who is in charge of "Show and Tell" in Your Classroom? Today, I want to share a Prezi created by a high school student in Mr. Kennedy’s history class. Just a small taste of what goes on in this classroom, but I hope to see more. What have your students created today….this week….this school year? Author adminPosted on February 27, 2013 Categories GeneralTags IFTTT, Middle School, TECH TREK, TechnologyLeave a comment on Who is in charge of "Show and Tell" in Your Classroom? Mrs. Taylor’s Science class has been studying space for the past several weeks and have researched, created, presented, and even pretended to be planets. Get a glimpse into all these great classroom activities through this project video! Author adminPosted on February 26, 2013 Categories GeneralTags IFTTT, Middle School, TECH TREK, TechnologyLeave a comment on Students Explore Space! Wow! Things have been so busy that I am just getting back to the blog….and continuing the idea that there is something on the web for all subjects and all grade levels. Today, I want to focus on “communication”. It is central to all human interactions: parents to children, spouse to spouse, boss to employee, teacher to teacher, teacher to student and parent….the list is endless. Technology has become a HUGE part of our culture for interpersonal communication, and it should translate seamlessly into school as well. Right? Well, not always. One hurdle is accessibility. Many of the tools we love to use personally, such as Twitter and Facebook, are often blocked at the public school level. While there are some understandable concerns in using and “controlling” the use of Twitter and Facebook, these are natural places for communication for literally millions of people. So, where can we go next? There are so many tools out there that it can be difficult to know, and, for many people, time can be a concern. So, let’s consider something clean, simple and very easy to use: Weebly.com or Weebly for Educators. This free tool allows you to create a website by just dragging and dropping. It is really that simple! Weebly can be used to quickly set up a site for classroom announcements, instructional videos, photo galleries, and links to classroom resources. If you join as an educator, you can even manage your students’ accounts and accept assignments online. Need to see more? Visit one of our very own Weebly sites: A Piece of Our Pi in Room 103! This great site was started by a busy math teacher and mom, Mrs. Spivey. So, if you need to communicate with your students beyond the classroom walls but have limited time to learn the ins-and-outs of a more complicate website builder or even consider yourself a “non-techie”, then Weebly is a great solution to go “high tech” without the hassles of a steep learning curve! Try it out! Author adminPosted on November 12, 2012 Categories GeneralTags IFTTT, Middle School, TECH TREK, TechnologyLeave a comment on Communication is Key! Think Technology is NOT for Your Subject?? With so many technology tools available these days, it is important for teachers to get out there to explore and play with what is available until they find the perfect fit for teaching style, content needs, technology skill level, and purpose. So many times, teachers think that THEIR subject or grade level is just not a good fit for technology, but there is something for everyone if you just look! Take “Art”, for example. What can we do with technology in art? Our teacher, Mrs. Spivey found Artsonia to be the perfect website for her subject. In Artsonia, she can create student accounts, upload pictures of her students’ projects, and even sell items that have the students’ artwork printed on them! To see our students’ work on Artsonia, just go to the website, find the box to select a school by name, and type the word “Eustace”. You will then see the link to the Middle School art work, and Mrs. Spivey has uploaded 472 student works that can be viewed and enjoyed by everyone! Parent permission is required to post work, and the students’ full names are not used. Author adminPosted on October 31, 2012 Categories GeneralTags IFTTT, Middle School, TECH TREK, TechnologyLeave a comment on Think Technology is NOT for Your Subject?? Help!! What do my students really know? It happens to every teacher! You have made your best effort to teach a concept to your students but are still experiencing that “Ferris Bueller” effect: “Anyone, anyone?”. You can almost hear the crickets in the room. But…(of course! ), technology can help! This past week, Mr. Rowley was working with students to master the basics of Newton’s Laws of Motion amid Red Ribbon Week, football games, pep rallies, and Fun Fridays complete with Halloween costumes! That’s some tough competition. So, he decided to see if they could transfer any of Newton’s Laws to real-life experiences and had students create presentations to describe the basics of these laws in action. Good times! Enjoy a short presentation of one of these projects! Author adminPosted on October 26, 2012 Categories GeneralTags IFTTT, Middle School, TECH TREK, TechnologyLeave a comment on Help!! What do my students really know? Our campus will be competing in Academic U.I.L. this year! I haven’t been involved with academic competition as a teacher in 13 years, and although the events remain much the same, the way materials and information are shared with districts has changed dramatically with the advances in technology. In homage to this trend, it is fitting to incorporate technology into the way our students prepare for these events as well, so a website dedicated to housing our Academic U.I.L. resources has been created and shared with some of our teams. Having online access for independent practice will be a tremendous asset for our students! If you have resources for your event, let me know so they can be added to our UIL Resource site! Student can easily find the site by visiting the Middle School page on the Eustace website. The link is found under “Some Useful Links”. Author adminPosted on October 25, 2012 Categories GeneralTags IFTTT, Middle School, TECH TREK, TechnologyLeave a comment on Technology Can Help! What do you do with 5 iPads? The Middle School is fortunate to have a small set of iPads for exclusive use on our campus, but teachers often find themselves wondering: what can I possibly do with only 5 iPads in a class of 25 (or more)? There are creative solutions for use, however, and several teachers at EMS have found ways to utilize this technology with great results, moving from traditional large, group instruction to small group centers/learning stations and projects. This past week, Mrs. Schwartz’ 6th grade reading class practiced figurative language and vocabulary building in a learning station where students could work in pairs. Kudos to teachers for shaking things up in class, moving the desks around, and making things happen! Have an idea, site, or an app that plays well in small groups? Let me know! We are ready to sync and go! Author adminPosted on October 24, 2012 Categories GeneralTags IFTTT, Middle School, TECH TREK, TechnologyLeave a comment on What do you do with 5 iPads?